Joe Bergbower had a plow day south of Newton, Illinois on September 26th. I met up with Jane Elliott and headed east to cover the event for Farm World and found Joe had something I love, yard art! Joe makes foxes, geckos, coyotes, turtles, people and an amazing bull all out of materials he had on the farm or had acquired over the years. “Nothing goes to waste on this farm,” Joe said. Joe not only uses everything on the farm, he also shares his knowledge. “When the grandkids are over and set down to watch TV, I say, ‘Let’s go out in the shop and make something’”. I thought long and hard as I looked longingly at the bull he made that would be perfect next to the stone Chevy truck that my husband’s cousin Karen and her husband Harry had given us a couple years back. Then I remembered – I had a book in my SUV ready to mail to a woman named Marilyn. I figured Marilyn wouldn’t mind if she got her book a day late. “It is going for a good cause,” I told Marilyn as I plucked her order out of the envelope and trotted back to Joe. I was hoping Jane Aumann, my co-author on Huber wouldn’t mind my sleight of hand, and I will reimburse her in money, pizza or yard art for her half of the take! Whatever her heart desires because, I was excited, I was thrilled, and best of all, so was Joe on our trade. 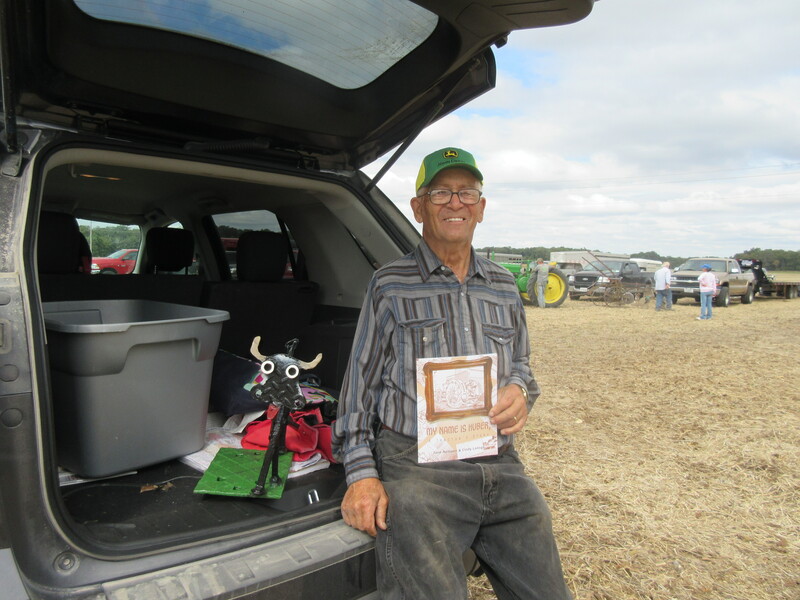 On the way back to our meeting place, Jane Elliott got to hear the clink, clink of my bull’s chain tail as we talked over the day and the sights and sounds of Joe’s big plow day. The bull will always be a reminder of the one book – for one bull. The best barter ever! Previous Post: Apple pie, oh my! Next Post: The Mug Tree, a roadside attraction!